Yesterday President Trump and Prime Minister May were seen holding hands while walking outside the West Wing of the White House. 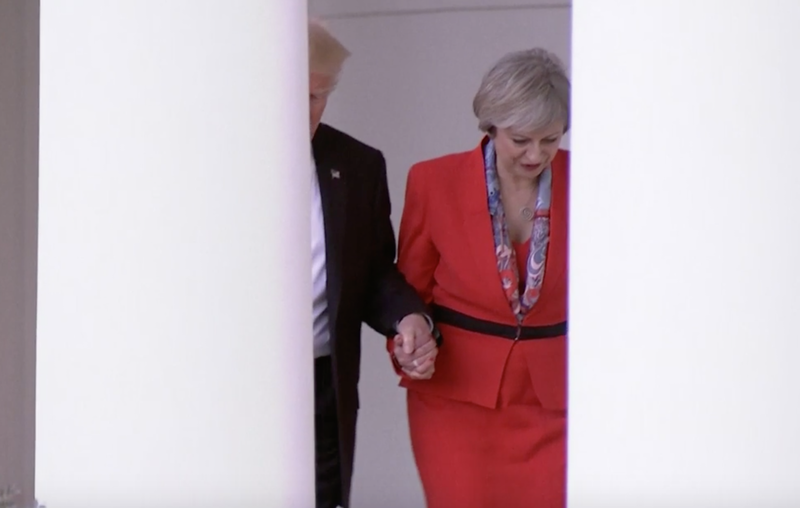 Subsequently several media sources reported that Donald Trump suffers from Bathmophobia - a fear of stairs or slopes - and this was the reason for him holding Theresa May's hand. 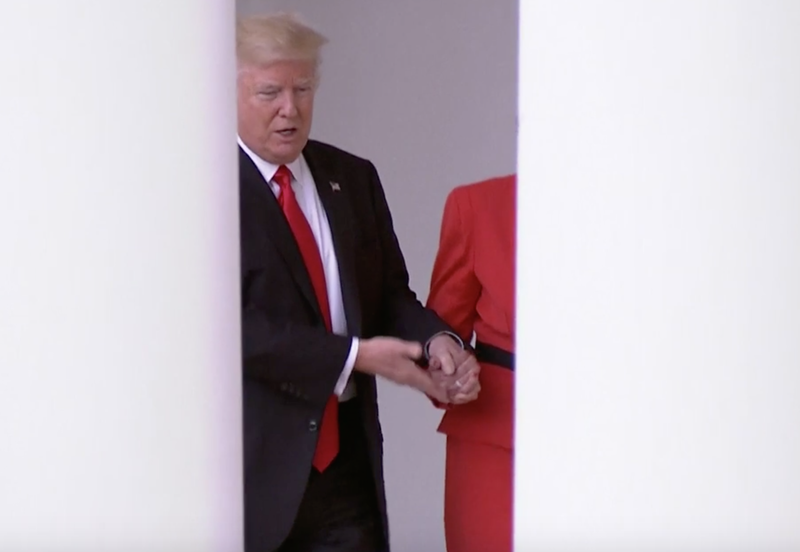 As the two began walking down a gentle slope (a ramp with an angle of approximately 10 degrees and 20 feet in length), President Trump took Prime Minister May's hand. However, note Trump's opposite (right) hand - it is relaxed. When people are walking down a hill, slope or stairs, etc., which THEY consider steep or a potential hazard - their hands and arm will show tension. This is manifested with the arms moving out from the torso with a simultaneous splaying of the fingers and thumb. This is not, however, what President Trump is displaying. Don't mistake this for Chivalry. What we're observing here is an example of "False Intimacy" and "False Affection" - as well as a "Alpha Dominance Display". 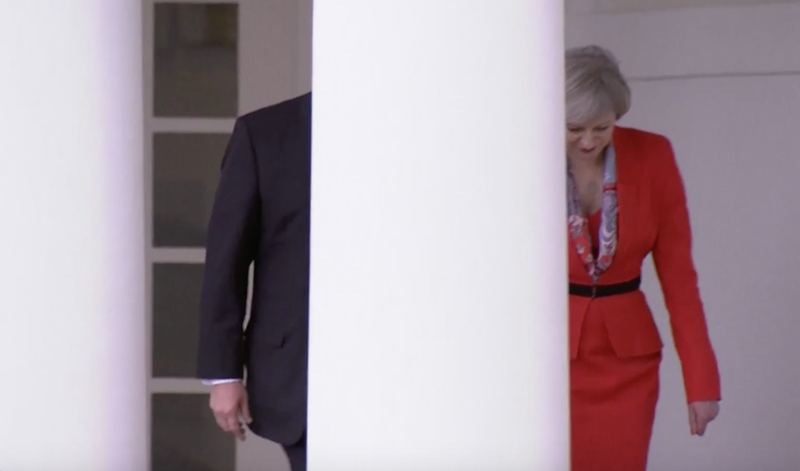 Donald Trump had only just met Theresa May that day. With the exception of shaking another person's hand and a few other cultural or protocol-specific scenarios - an invasion of another's personal space (Intimate Space) should NOT be undertaken unless there is true affection or intimacy. Just before their walk down this slope was complete, Trump taps May on the back of her hand. This is a nonverbal signal to "Let Go Now". It's very much akin to the "Disengagement Hint" of patting another person on the back - often seen at the cessation (unilaterally decided) of a hug.